The Premiere Stakes is a Group 2 sprint race for quality types held at Royal Randwick Racecourse on Epsom Handicap Day in late September or early October during the Sydney Spring Racing Carnival. Epsom Handicap Day is the one of the biggest Sydney race meetings of the spring and features three Group 1 races: the Epsom Handicap, The Metropolitan and the Flight Stakes. Along with those three elite levels a host of other key events are on the card including the Premiere Stakes that runs over 1200m under weight-for-age conditions and offers a very generous $500,000 in total prize money. Many of the Premiere Stakes graduates go on to contest the Group 1 features of the Melbourne Spring Racing Carnival over similar distance including the Manikato Stakes at Moonee Valley, the double last achieved by Spark Of Life (2004). It also now serves as a final lead-up for star sprinters running in the Restricted $10 million The Everest (1200m) held back at Randwick in mid-October. The latest edition of the Premiere Stakes took place on Saturday September 29, 2018. Premiere Stakes odds favour proven Sydney runners with good form from the winter or a lead-up win in a local race like The Shorts at the same track earlier in the month. Runners in the top half of the Premiere Stakes betting market have a strong strike-rate in the race over the past decade and tipping the favourite has proven a winning formula many times in recent years. The updated Premiere Stakes 2018 betting odds and links to our markets on the lucrative Group 2 Epsom Handicap Day sprint feature will be provided below the week of the race so stay tuned for the top Randwick racing odds online. Good Premiere Stakes tips to consider include looking for proven performers at the Randwick track, sprinters with good form over the 1200m distance and local hopes coming off a lead-up run in The Shorts. Mares also have a decent recent record in the race with wins by the likes of Red Tracer (2012), Arinosa (2013) and In Her Time (2017) so tipping the in-form mares is another Premiere Stakes betting tip. Checking the form of races like The Shorts and the early The Everest betting markets for any horses in the Premiere Stakes field is also a nice tip to take to the bookies on Epsom Day. Our Ladbrokes’ insider Premiere Stakes 2018 betting tips and Randwick racing selections will be detailed below the week of the race so bookmark this page for the spring sprinters to get behind at the best price this season. The Premiere Stakes field attracts the season’s most promising local Sydney sprinters and interstate runners from Melbourne warming up for the Group 1 spring sprints. Horses often come off a lead-up run at Randwick in the Group 2 The Shorts (1100m) and in 2015 The Shorts winner Rebel Dane ran second in the Premiere Stakes next start. Rebel Dane also went on to run third at Moonee Valley in the Group 1 Manikato Stakes (1200m) later that month. The following year Takedown (2016) completed The Shorts – Premiere Stakes double. The Shorts form also held up in 2014 when Famous Seamous improved on his third to win the Premiere Stakes, which he had run third in the previous year. 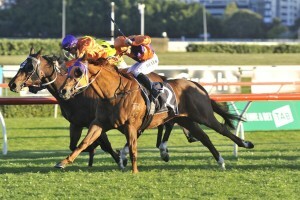 In 2012 Satin Shoes ran second in both The Shorts and the Premiere Stakes. Premiere Stakes winner Takedown (2016) went on to win that year’s Group 1 Winterbottom Stakes in Perth. Photo Credit: Steve Hart. The Premiere Stakes nominations are taken the Monday before the race runs on the Saturday with the final field of acceptances and bariers out on the Wednesday followed by the odds opening at bookmakers around the country. The official Premiere Stakes 2018 field and barriers are set for release on the Wednesday leading-up to Epsom Handicap Day 2018 and will be listed below so stay tuned to see the sprinters that make the line-up, including a host of early The Everest contenders. The Premiere Stakes 2018 nominations close the Monday of race week and always feature a quality line-up of sprinters. The official early Premiere Stakes entries will be available below once released. The Premiere Stakes form guide lists all the crucial information and statistics from the jockeys and barriers to the track / distance records of the runners in the field. In recent years the Premiere Stakes form has stacked up in tougher spring races including in 2015 when the winner Rebel Dane ran third in the Group 1 Darley Classic (1200m) at Flemington two runs later during the Melbourne Cup Carnival. Also keep an eye on the Premiere Stakes form guide for The Shorts graduates who will appreciate the extra 100m and those proven at the Royal Randwick track. The Premiere Stakes results have been dominated by Sydney sprinters coming out of The Shorts in the past decade as well as the quality mares taking on the boys in the Group 2. Notable recent Premiere Stakes winners include Terravista (2015), Famous Seamus (2014), Red Tracer (2012) and Hot Danish (2010). The official Premiere Stakes 2018 result sand finishing order will be detailed below once the race is run and won on Saturday September 29, 2018.